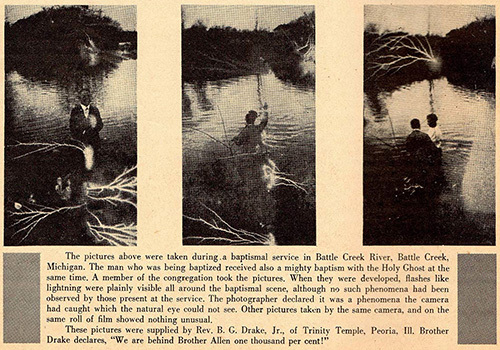 The photograph of sacred forms permeating the performance of prayer in the popular Miracle Magazine provides an example of an apparatus of belief. The apparatus of belief refers to any device, prosthesis, or material object that produces an experience of sacred presence for the religious subject. Once again, the question of “normal” sensory capacities and their extension and augmentation through material media and charismatic techniques articulates the apparatus of belief. During performances of prayer, the apparatus of belief enframes perceptual experience in particular ways, and in so doing has the capacity to organize an experience of excess that subsists beyond the everyday capacities of sensation. In this way, the apparatus of belief is not only a device such as the camera, ostentatiously revealing the lightning-like bolts of Holy Ghost power to the “natural vision” of the audience, but subsists in more subtle—and perhaps more experientially compelling—spaces of sensory displacement. The radio, for instance, became a crucial apparatus of belief for modern charismatic revivals by allowing the religious subject to “hear” the sound of the voice-in-prayer as a sensation of warm vibrations registered through manual contact with the radio. The votive candle, that simple ensemble of wax, wick, and flame, is perhaps one of the oldest apparati of belief; the subtle flickers of its slow holocaust register a presence and efficacy that subsists outside the everyday sensory organizations (the skin of the pray-er was not able to feel the sacred breath that caused the candle to dance in affirmation). By registering a presence normally unavailable to the religious subject, the apparatus produces a compelling sensation of excess, or a presence that subsists outside the everyday structures of awareness. Like the flicker of a votive candle persisting in the darkness long after the pray-er has left the space of the altar, the apparatus of belief suggests a new definition of prayer that moves beyond the typical themes of intentionality, interiority, and personal decision. In some of the most prolific traditions of prayer in the modern world, “belief” does not reside within the interiorities of the religious subject as a kind of standing reserve that is then directed toward an intellectualized point of reference. Rather, belief makes its appearance as a calling or demand upon the subject that is voiced by apparati radically exterior to it. In this economy of faith, the performance of prayer becomes an ensemble of bodily techniques, media extensions, and material objects that allow the subject to somehow “plug in” to a presence that persists just beyond the enframements of the everyday.